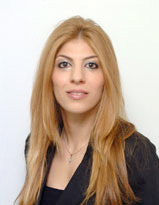 Dr Michailina Siakalli is a Lecturer at the Neapolis University in the field of Quantitative Analysis (Mathematics and Statistics). In 2003, she completed her BSc studies in Pure Mathematics at the University of Cyprus and in 2004 she obtained her MSc in Financial Mathematics from Cass Business School, City University (UK). In 2005 she was awarded a scholarship from the University of Sheffield and in 2008 she obtained her Ph.D. from the University of Sheffield (UK) in the field of Stochastic Differential Equations driven by Lévy Process. In the period 2006-2008 she obtained academic teaching experience by teaching in undergraduate students at the University of Sheffield. She has publications in peer reviewed journals and she is a reviewer in scientific journals.